This entry was posted in Comments about Cycling on February 4, 2016 by Steve Tilford. Nope, no one is just randomly offering you a contract to race bikes professionally. Some researchers in the Netherlands are doing a project to try to confirm what the effects of EPO are on cyclists. 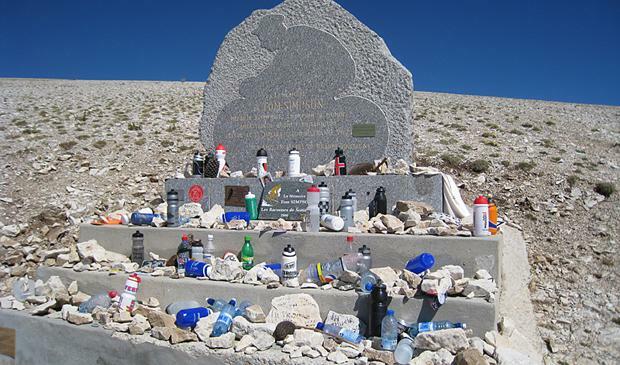 So they came up with this brilliant idea of paying some well trained riders to take EPO and then ride up Mount Ventoux. You can make close to a grand for this. I’m too old for the study. So, if you want to maybe feel the difference a little EPO might make, you should consider applying. Just click the link above, but you’re going to have to read Dutch. I used the word maybe because you could end up in the placebo group and then you have to struggle up the climb normally aspirated, which probably would be tough. I’m pretty sure what they are going to “discover”. I’m thinking these guys just what to go to France and ride the famous climb and have figured out a way to get someone else to pay for it. SInce it is an official study, you probably won’t have time to stop at the shrine to Tommy Simpson. You called it. Sham study. Use other people’s money to fund Ventoux trip. Brilliant. Like crowdfunding. Reckon enough anecdotal EPO data out there already. The “evidence” is out there in plain sight. Lance’s transformation from a rouleur to a climber comes to mind. Or Jaja switching from a classics sprinter to grand tour climber. Think what they are saying is there have been very limited scientific studies done on EPO. With an actual control group and statistical analysis of the changes across a large group. Most of the stuff I have read are studies of changes in individuals or very small sample groups. When reading a study you always look at Who published, where /what was the institution is, what source it was published in, the size of the study, how the statistics were compiled, conclusions made, the repeatability of the study, and how close to scientific modeling the study held up. I have read many of BS studies that seem good on the outside but were very flawed in some way. Be interesting to see their results. And how they set it up. Have you seen this Steve? From this weeks New Scientist Magazine. Note the reference about Team Sky. “Even so, some of the world’s leading elite endurance sports teams have begun to test a more direct way to alter perception of effort: zapping the brain with electricity. The Red Bull High Performance team, for instance, is working with neuroscientists from Weill Cornell Medical College in New York City and Pepperdine University in Malibu, California, to see how its athletes respond to transcranial direct-current stimulation (tDCS), where a weak electrical current is applied to the brain. Team Sky, the all-conquering British cycling outfit, is also reported to be exploring the technique’s potential. The trials build on work suggesting which brain regions it might be best to target. In 2011, a team led by Kai Lutz at the University of Zurich in Switzerland measured the electrical activity in the brains of cyclists as they pedalled to exhaustion. As the subjects tired, Lutz noticed a steady increase in the intensity of communication between the motor cortex, which controls movement, and the insular cortex, which processes signals from the muscles and other components of the body. The results indicate that your insular cortex responds to signals of distress by ordering the motor cortex to give it a rest. Based on this, Alexandre Okano at the Federal University of Rio Grande do Norte in Natal, Brazil, gave a group of cyclists a 10-minute bout of tDCS over the insular cortex. He found that they generated 4 per cent more power and reported lower perceived effort levels than before the brain zaps. Actually, this kind of thing isn’t that bad an idea … having proof of the magnitude of the effect goes a long way to showing just how much benefit everyone caught doping in the past was getting … and just how much of a magic asterisk to add to their names. Also, might go some way to determining who else might have been doping, just by the magnitude of the difference in their performance over time. The adverse effects of EPO (ie venous thrombosis, stroke) have been well documented in multiple randomized placebo controlled trials, even in medical conditions warranting its use. That means that this kind of testing in this setting is unethical and dangerous. Hope no one gets hurt. Increasing ones available oxygen capacity sounds, at face value, like it would certainly help an endurance athlete, but there is a point at which more oxygen won’t help. Greg Lemond was famous for his super high VO2 Max test results. His ability to use the oxygen already in his blood was better than everyone else in the race. I suspect the next generation of endurance PED’s will focus on ones ability to use existing oxygen rather than increasing capacity. This would essentially increase ones VO2 max by way of pharmaceutical help. The above comments are correct, in suggesting very little research has been done around EPO & performance. This lack of research is a main reason I’d never suggest anyone try it. The dangers are quite high. I doubt motors will get much traction in the cheating portion of sport, but androgen muscle recovery and oxygen consumption aids will be the future. This is where the UCI / WADA / USADA should try to aim some resources. The following link is to an article in Outside Magazine written by an endurance cyclist who performed a self-test of performance enhancing drugs. Not a scientific study, but insightful. Ummmm, that’s exactly what EPO already does. It does not increase oxygen compacity but instead increases oxygen transporting ability by increasing your oxygen carrying/supplying RBC’s. On the one hand this is a silly study demonstrating what most cycling fans already know. On the other hand, the term “anecdotal evidence” is an anathema to scientists; it is a literal contradiction in terms and there is no such thing. We know vector doping is real, we understand the physiology, but until someone does a direct study with good pos/neg controls, it’s still a hypothesis. Now what good is to be gained from this.., just tossing it out there, but with hard data that can line up a watts/kg gained with ug/kg doseags, this could go further to being used as evidence in the cases when someone comes up hot in a doping test in or to bolster the biopassport system. And real data strictly for knowledge’s sake is still a fine thing (with a great big ol cherry on top of a cycling “work” trip). What happens when the treated group goes home and destroys the local race scene though. It is an interesting investigation, Whoever the question that immediately comes to mind is how may times will they go up MV. It’s so hard to control. Will each cyclist ride it daily, weekly, monthly? How will they control conditions? What if there’s a huge parade of buses one day, and rain the next? Do those factor in? To really control for externals they’d have to do hundreds of trials over the course of several months (as in, you’re riding up MV every day for the next 24 weeks…not too likely). This would make a lot more sense as ‘science’ if they were controlling for every condition except EPO. Like, for example, if they did it through Zwift. Same course, same conditions, easily controlled for all but one variable. As it is, it’s kind of laughable, except as material for the Journal of Irreproducible Results. Shoot, that first word in the second sentence should be “However”, not “Whoever”. Duh. Its “tough” either way, one group just goes faster. Sorta like all you genetic phenoms believing you are ‘tougher.’ Nope you just go faster, than us poorly aspirated plebes. The 2 year ban from racing comes at no additional cost to the 1 thousand. Sounds like a study worthy of sponsorship by the prestigious Josef Mengele Institute. Tom Simpson died from taking speed, and blew up his heart. He was doped to the gills. Why is he considered a past star… And other dopers flogged? Most people are casually familiar with “EPO” as a term but don’t understand it. It boils down to revolutionary improvements in time to exhaustion. I think it has to do with the personality of the guy more than alleged doping, combined with untimely death. Same reason Marco Pantani is so loved while BigTex is…well…pretty much hated. Nice guys who die young get remembered even if they doped, while a-holes who doped just get… hated.